There are many ways of improving product’s sales on a ThemeForest. 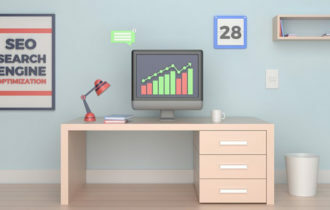 Some authors choose advertising and SEO, some go further and develop marketing campaigns to promote their items, some just self-promote on forums and in comments. However, without knowing the template market all these efforts may become useless. In order for your campaigns be more successful, we prepared for you some ThemeForest statistics, that can’t be found nowhere else. In January there were 1315 new items uploaded and 408 of them are WordPress Themes. This may not look too impressive but it will if we take a look at WordPress sales on ThemeForest. When it comes to sales there’s definitely no competitors, because WordPress get more than 70% out of overall sales on the marketplace. 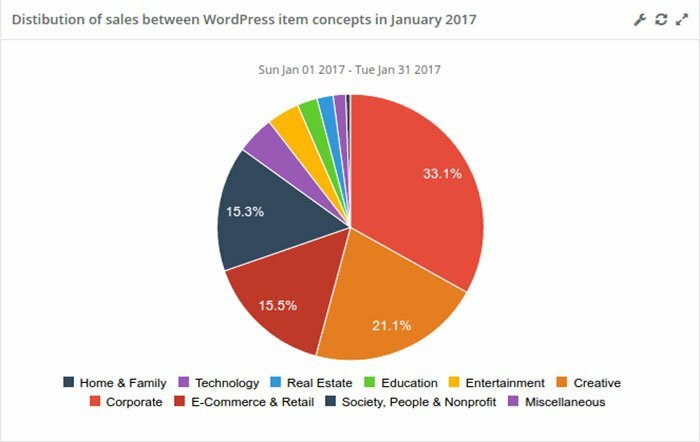 On the pie chart you can see the proportion between WordPress category and whole ThemeForest. 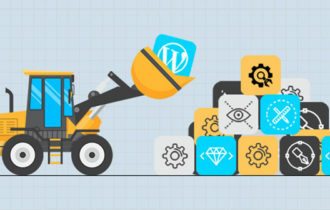 There were 179622 item sales on the marketplace and 128886 of them – are WordPress sales, and there is a conclusion that every 1.4 item sold on ThemeForest is a WordPress theme. Here we can see that there are about 5000 sales of WordPress themes on peak days of the week(which are usually Tuesday and Wednesday) and some information we already know – 128886 sales in January. However, the key value here is the last one. 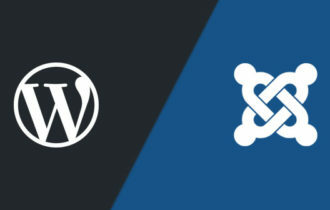 According to Envato, there are currently more than 8000 active WordPress themes available and according to Stattie there are 6500 WordPress themes that were sold at least once during January. That makes more than 80 percent of the total value. If we exclude old, not supported and bad rated items from overall amount of themes available, we can have the amount that is very close to 6500. That means that almost every theme gets at least 1 sale in a month. But how many items are sold daily? The amount of sold items varies from a bit more than 1200 on weekdays (that are low days for the market) to more than 1800 on high days like Tuesday and Wednesday. It’s noteworhy that this amount is slowly raising and you can even see this tendency if you look at the days of decrease: the amount is getting closer to the tick of 1300 instead of 1200. The other graph shows the average rate of sales for items that were sold. As you can see, it varies from almost 2.2 to a bit less than 2.9 during January. Please note that this value was calculated only for those items that were sold during the period. While talking about sales we can’t miss such an important things as tags. Basically, tags help customers to find the theme they need. 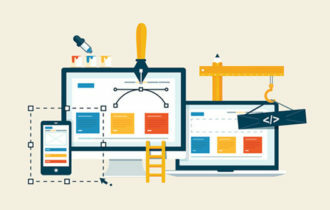 Not so many customers are coming to ThemeForest to buy some particular product, but they look for the features of design and functionality that are necessary for them. Thus, tags are rather important and good tagging can attract more customers to the product. Here we see two tables: the first one is the table of most used tags for WordPress themes on ThemeForest for all time and other one is showing the TOP-10 tags that got most sales in January. You can notice that the tables are quite similar, because these tags represent the common design features among most popular item concepts, which happened to be Corporate and Creative. And for the dessert: the distribution of sales among different types of authors. Apparently, Elite and Power Elite authors share almost the whole pie and usual authors don’t get many sales. That’s all for today. The report that was made during writing this article is available here. More ThemeForest statistics can be found on Stattie. Hope you liked it. Are you an author on Themeforest? If yes, do you provide market research before developing new product? Co-founder of Stattie - a tool for viewing statitstics on ThemeForest and other marketplaces. Passionate about templates, numbers and information.